Great combination of flavors and application of techniques in this dessert by molecular gastronomy Chef Will Goldfarb at Ku De Ta restaurant in Bali. 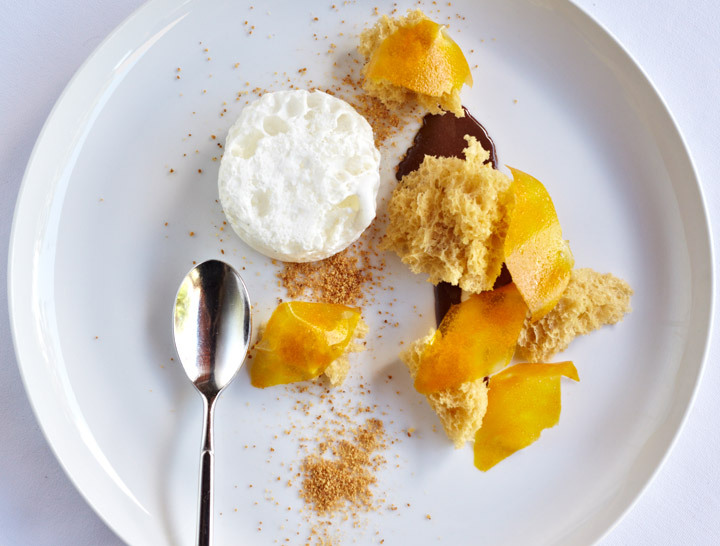 A light and fluffy cashew praline sponge cake is paired with smooth bitter cocoa yogurt, spiced cream bubbles and crispy fresh mango petals. In this recipe you’ll learn a few new techniques and smart use of some molecular ingredients. 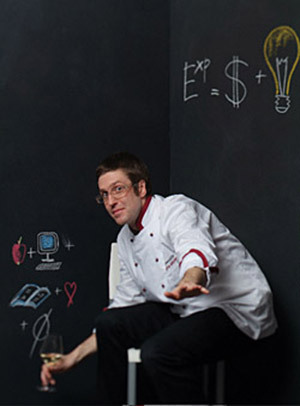 Chef Will Goldfarb is an expert and revolutionary in the pastry field. He has worked in the kitchens of renowned chefs such as Ferran Adria, Tetsuya Wakuda, Paul Liebrandt and Morimoto. Chef Will Goldfarb was regarded in Ferran Adria’s book, “Food for Art, Art for Food”, as one of the leading modern chefs and was identified in Lisa Abend’s book, “The Sorcerer’s Apprentices”, as one of the finest chefs in the world to pass through the El Bulli kitchen. Chef Will Goldfarb has also received several awards. He was named as one of the 10 Best Pastry Chefs in America by Pastry Art and Design, received the Starchef “Rising Star” award and earned a James Beard nomination for Best Pastry Chef in America. This dessert is one of his latest modernist creations at Ku De Ta restaurant in Bali. The modern sponge cake is made by cooking cashew praline foam from an ISI Whip canister in a microwave. It not only results in a wonderful moist and fluffy sponge cake but it is also fast and easy to make. You can have the mix ready in the ISI Whip canister and, at the time of serving, pump some foam into a cup and after just 30 seconds in the microwave, the sponge cake is ready to be served! To create the cream bubbles, you’ll be using sucrose ester as an emulsifier. And you’ll learn that sodium alginate can be used for something else in addition to spherification! You’ll be using sodium alginate as a thickener for the dehydrated mango petals. Molcular gastronomy Chef Will Goldfarb named this dessert “LONELINESS TRANSFORMED FROM ANXIETY INTO CALM”. Enjoy! 1- Mix all ingredients in a high speed blender. 2- Strain through a fine mesh sieve. 3- Fill an ISI Whip canister (1L) with the mix, and charge with two N2O cartridges. 4- Allow to rest for 6 hours. 5- Cut slits at the bottom of a paper cup using a paring knife. One slit in the center and three or four on the edges should be sufficient. This will ensure that the cake does not steam and get too moist. 6- Spray 20 grams of base into the perforated cup, and microwave at 1000 watts for approximately 30 seconds. Unmold and reserve warm. 1- Bring water, sugar, cream, and cocoa to a boil. Reduce to a syrup. 2- Allow to cool and mix with yogurt. Reserve cold. 1- Bring all ingredients to a boil. 2- Mix well with a hand blender. 3- Strain through a fine mesh sieve. 4- Reserve warm and foam a la minute with a hand blender right before serving. 3- Spread onto acetate sheet previously cut into the shape of petals. 4- Dry at 43°C (110°F) for 3 hours. 5- Flip over and dry for 3 more hours. 6- Reserve dry in a container with desiccant packets. 1- Spread some bitter cocoa yogurt on the plate. 2- Add some pieces of warn sponge cake. 3- With the immersion blender introduce air to the cream mix to make bubbles. Scoop some cream bubbles on the plate. 4- Scatter a few mango petals on top.